Picture taken by @dknightvision at Orange Homegrown Farmers Market. A college campus is always bustling with commotion, but every Saturday morning, Chapman University is consumed by market activity. Orange Homegrown Farmers and Artisan Market, located at an old citrus packinghouse owned by Chapman, swarms and ebbs with distinct touches of community. The market has an outcropping of support, from local chefs, volunteers, and other organizations, which all enable Orange Home Grown’s efforts to enrich and give back to the community. From scholarships to food pantry donations, to a market “transparency” commitment, every Saturday all involved walk away with more than the contents of their tote bags. The market is dependent as much as it is depended on. Take for instance, the Park Your Paws volunteer booth. Every week volunteers watch patrons’ dogs while they shop. Many of the volunteers are Chapman students that are attending the college out of state and miss their own dogs. Through this market service, volunteers find a bit of solace while lending a hand and scratching a furry belly or two. Little details like these form natural relationships and community bonds. Megan Penn, Co-founder and Executive Director notes, “it takes a village” to pull off the market magic every Saturday. We are excited for OHG to take over our Instagram and share what their community looks likes! Farmers Market Coalition: Give us a little bit of background on your market. Megan Penn: Our market turned 5 on May 7, 2016! Our market is run and managed by a non-profit Board of 10 (volunteers and unpaid) 1 paid Executive Director, and 2 paid Market Managers. We have anywhere from 40-50 vendors depending on the season. 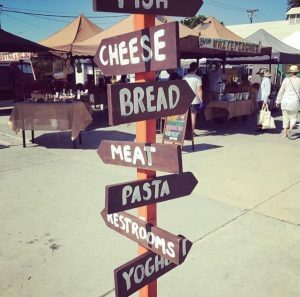 Our market is made up of certified California farmers and food artisans. We allow local art and craft vendors to be part of the market seasonally for 7 weeks during November and December. This allows local residents to get involved in the market without losing our focus on food. This has been very important to us… to keep the market “Food Based and Chef Driven”. Our market is “For Residents by Residents”. We have events, many of which are educational: monthly cooking demos to highlight seasonal ingredients, a monthly Kids Club to connect children to food and agriculture,and market shopping tours (to teach patrons how to successfully stretch their dollar). We just started accepting EBT this past March, we have “Park Your Paws” pet sitting, and mini shopping carts for the kids to use while at the market. We have weekly guest musicians and complimentary coffee and pastries provided by Chapman University (while supplies last). Our market takes place on a historic packinghouse property owned by Chapman University. In fact this was the last citrus packinghouse to operate in Orange County, CA (closed in 2006). We feel proud to bring produce back to this historic location once again, giving it life each Saturday. Our market is known as a “health conscious” market. We strive to provide wholesome healthy options to the community and to really highlight our local farmers. We have grass-fed grass-finished beef being raised 30 minutes away on the last piece of cattle land in Orange County at our market. We have meat products, organic cheeses, grass-fed butter and sheep’s milk yogurt. Local honey coming from hives that have been saved through the work of Guerrilla Beekeepers. We have eggs, California olive oil, avocado oil, fermented foods such as kraut and kombucha, beautiful heirloom varieties of veggies being grown 30 miles away in Riverside. Because this market was started by residents to make locally grown food available to their neighbors and friends, the market really has a grass-roots, hometown, neighborly feel. You can find elected officials, city staff, business owners, and more all spending their mornings at the market connecting with one another and “being community”. Farmers Market Coalition: Where is the market situated? MP: Our market is situated on a fairly urban site and our location is incredible! We are located within a one mile square historic district. Old Towne, Orange Historic District, a one square-mile around the original plaza of Orange, California, contains many of the original structures built in the period after the City’s incorporation. It is a vibrant commercial district, containing Orange County’s oldest operating bank and the oldest operating soda fountain. The Historic District was listed on the National Register of Historic Places in 1997, and is the largest National Register District in California. The Old Towne Preservation Association is a non-profit organization dedicated to maintaining the district. Neighbors can walk and ride their bike to the market, grab coffee and a bite to eat and the restaurants and boutiques are just 2 blocks away. Chapman University is just across the street. The site backs up to railroad tracks (this was an operating packinghouse up until 2006- they needed a way to transport the citrus that was packed here). This is our only location and we operate year round on Saturday’s from 9am to 1pm. MP: We use Facebook, Instagram and our website to promote the market through social media. We have had door hangers delivered door to door, sent postcards in the mail, we hang a street banner up in our downtown core, but are constantly looking for new ways to advertise and get the word out about the market. FMC: What is a normal market day like and what makes it special? MP: The vibe is friendly, inviting, educational and fun. The buzz of conversation, the colors of the fruits and veggies, the music and smiles make it an all-around great time! You can find kids dancing, neighbors helping one another carrying their bags of produce to their cars, groups of Chapman students showing up on their bikes, and people engaging with one another. It’s magic for 4 hours every Saturday! We live in a community where people want to get involved. The location, the group of people who have made this market their passion, the volunteers that fuel it and get involved, our amazing new market managers…. it’s this combination that makes it so special. MP: A big success has been our farmer and artisan tours. We have been working to visit each of our farmers and artisans on location. It is a lot of work, but we photograph and interview each one and share our experiences through our blog on our website. We also print the pics and have a binder we keep at the market info booth to share information with our market patrons about our vendors. We also share this information in our weekly eblast. This has been very successful and we have referred to it as out “Transparency or Know your Farmer” campaign. FMC: How did you guys join up with so many non-profit collaborations, enlist your volunteers, and link up with chefs/restaurants? What advice would you give markets trying to do the same? MP: Everything we do seems to be an “organic process”. By hosting a weekly event in the community, we have had the opportunity to engage with so many residents in and around the City. Because of this, relationships start to form and opportunities present themselves. We make a conscious effort to collaborate with other like-minded organizations and businesses who truly are looking to make a positive impact in Orange. Many of the non-profits we work with are small grassroots organizations such as ourselves, or small local businesses interested in giving back to the local community. The Chef support has been a bit tricky. Saturday is a tough day for restaurants and chefs to shop. They want to be at a market on Wednesday or Thursday so they can prep for their weekend service. We formed an Advisory Board for our organization and strategically invited a local Executive Chef and Master Baker to be on the board who are well known in the community and put a priority on sourcing local. They have become advocated for our organization and talk with others in the industry to help drive chef support our way. We also constantly are looking for quality farmers who are growing heirloom and unusual items to attract chefs. The chefs want to be inspired and they also look for quality, so by connecting with local chefs, we gain knowledge of what restaurants want. On occasion, we have had Board members drop off produce orders to local restaurants to make sure they can get what they need from the market (since some have a tough time leaving their restaurants to come down to the market on Saturday). We also have created a chef parking space in the front of the market for easy access for the chefs. We also hold two large shopping carts at the info booth for chefs because when they come to shop, they are usually purchasing a large quantity or are picking up a large order from a farmer. The more you can do it make shopping at the market convenient for a chef or restaurant, the better. FMC: How long has OHG offered scholarships and how did that program come to fruition? MP: We have given out scholarships for 3 years, and we are forming our scholarship committee right now for 2017. To date we have given out over $16,000 in scholarship funds, and every year, at least one recipient has been a farmer (or one of their relatives) that participates in our weekly farmer’s market. For our organization, it has always been very important to give back. We know how hard our farmers work, and this is one small way we can support them, as well as the youth in our community. It is also important to note that by shopping at our farmer’s market, you are not only supporting small local family farms and food artisans, you are also supporting a local non-profit that uses the proceeds from the farmers market to run additional community based programs such as our OHG scholarship program, the OHG & OPLF Seed Lending Library, and the OHG Education Farm. The scholarship program was one of our original goals when forming our non-profit to run the market. We are proud to provide this opportunity to the youth in our community and we are working on additional ways to grow this scholarship program. FMC: What are some of the driving forces behind the scenes that keep the market running smoothly? MP: The driving force behind our market is our incredible market manager Lisa David. Her passion and excitement for the market is infectious. She is constantly thinking of new ways to engage market patrons and farmers and artisans at the market. From a food literacy program (glossary of market terms, and market signage in both Spanish and English), to free monthly market tours, Lisa is constantly on the go both during the week in prep of the market, and the day of the market. In addition, we have two young assistant market managers that support Lisa, and our incredible OHG Board members are at the market each week to lend additional support for our monthly programs such as our OHG Kid’s Club (which was started because of the 2 years of funding we received from the FMC and Chipotle for POP Club) and cooking demos. Running a successful farmer’s market takes a village! A lot of people (including volunteers for “Park Your Paws”) come together every week to make this community driven event a success!